This is a popular walk that combines parts of Walk 10 (BREAM HEAD/TE WHARA TRACK) and Walk 9 (PEACH COVE TRACK) to form a loop walk. 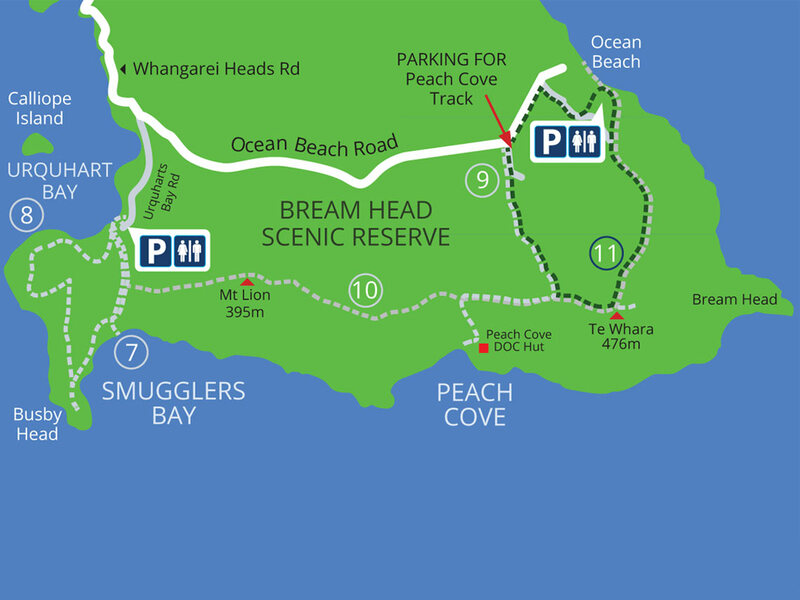 Follow the Peach Cove track until it is intercepted by the Bream Head/Te Whara track. At this point, head left on to the Te Whara Track and carry on to climb the Te Whara/Bream Head Summit at 476m above sea level and enjoy spectacular coastal 360 degree panoramic views. This vantage point, with one of the best views in Northland, is reached via a spur track which follows the ridge line just as you start to descend. Look out for this track at the top of the first set of descending stairs having just traversed around a large rock. The summit rock is a short distance along the track. Climbing the rock is challenging but well worth the effort. Care should be taken as there are steep drop offs in this area. Heading towards Ocean Beach you will pass the WWII naval radar station and lighthouse. Once you have arrived at Ocean Beach, walk along the water’s edge until you are aligned with Ocean Beach Surf Club on the side of the hill. Look out for a sandy track that will take you over the sand dunes and along to Ocean Beach car park and toilets. Walk through the car park and follow the road up to Ocean Beach Road. Turn left and follow the road back to the Peach Cove car park.